Welcome to FanDuel Hindsight, where we'll recap the previous week on FanDuel, focusing on the Sunday Million tournament, which has a $1 Million grand prize. We'll use the benefit of hindsight to see what lessons can be learned about the Sunday Million winner's low-owned, difference-making plays, then check in on how the most popular plays of the week fared. Editor's Note: 4for4 has an ALL-NEW DFS SUBSCRIPTION! It includes our revolutionary Lineup Generator, Stack Value Reports, Ceiling & Floor Projections, GPP-Specific Articles, Ownership Outlooks, DFS Theory Articles, Lineup Construction Articles, a Downloadable .csv with Projections and Salary Data, and much more! DETAILS HERE! Previous subscribers don't worry, you'll get the same DFS content you got last season, but we think you'll want to UPGRADE to our DFS subscription because it takes our DFS content to the next level!) 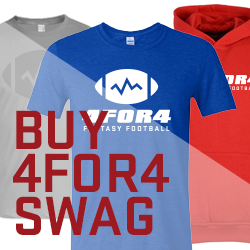 Don't forget to enter FanDuel's 4for4 Football Championship! 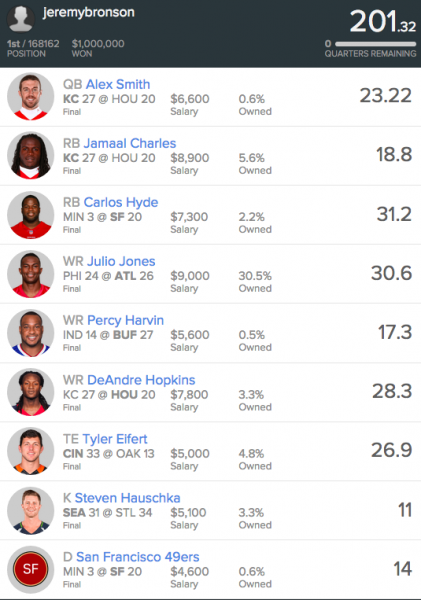 In winning the $1 million grand prize, jeremybronson used a very unique lineup, fielding only one popular play: Julio Jones, owned in 30.5 percent of lineups. Let's break down his low-owned plays. He scored 3.35 points per $1000, with six of his nine players eclipsing three points per $1000 and no players with less than two points per $1000. Why No One Was On Him: Smith averaged the 26th-most points of all fantasy QBs in 2014. Chiefs-Texans had an over/under of 41, one of the lowest of the week. Hindsight bias: Smith has legitimate weapons at all three skill positions: Jamaal Charles at RB, Jeremy Maclin at TE, and Travis Kelce at TE. They combined for 16 catches, 204 yards, and three TDs -- that's 73 percent of Smith's completions, 84 percent of his passing yards, and 100 percent of his TDs. Also, the Vegas line moved from Houston being a one-point favorite to the Chiefs being a one-point favorite on the morning of the game, which is very significant; historically, passers on favorites fare a lot better than those on udnerdogs. Why No One Was On Him: The Texans were above-average against RBs in 2014 and there were more attractive options at his cost in Eddie Lacy, Jeremy Hill, and DeMarco Murray. Hindsight bias: One of the elite dual threat RB talents in the NFL whenever he takes the field, Charles is one of the few RBs who always makes for a viable stacking option with his QB. He's also a big part of the Chiefs red zone offense, and that was evident last week as he got touches on 60 percent of the Chiefs red zone plays, cashing in for one score. Why No One Was On Him: Hyde was thought to be a two-down back dependent on game script, the the 49ers were underdogs to the Vikings. Hindsight bias: Failing to make major changes from a 2014 unit that allowed 4.46 yards per carry and had a 25th-ranked run defense DVOA​1, the Vikings' defensive weakness reared it's ugly head, allowing Hyde 168 yards on 26 carries (6.46 YPC). Talk of a 49ers' defensive demise may have been premature, as they stifled Teddy Bridgewater and remained in positive game script from the first quarter on. Why No One Was On Him: He was thought to be the third WR on a low-volume passing attack in Tyrod Taylor'a first start. Hindsight bias: It was highly likely the Bills wouldn't want to test Sammy Watkins on Vontae Davis, leaving targets open for Harvin against a thin Colts secondary minus starting corner Greg Toler. Why No One Was On Him: He was coming off a season missed due to an elbow injury. Hindsight bias: The Raiders were below average against TEs in 2014 and struggle in coverage. Eifert was a first-round pick and Jermaine Gresham is no longer around to vulture targets and TDs from Eifert. These both offered differentiation in terms of being low-owned sources of solid points, but, some higher owned chalk plays at both kicker and defense (such as Brandon McManus and the aforementioned New York Jets, respectively) outscored the Hauschka-49ers combo. How Did the Most Popular Plays of the Week Do? Let's break down the most popular (20-plus percent owned) plays of the week in the FanDuel Sunday Million. Adams did account for 31 percent of Aaron Rodgers' 189 passing yards, but failed to reel in any of Rodgers' three passing scores. Rodgers overthrew Adams in the back of the end zone on what would have been a 20-yard TD pass in the first quarter. Jones didn't disappoint against one of the weakest defenses against WRs a season ago in a game with the highest Vegas over/under. Olsen had a TD called back on a questionable offensive pass interference call against him, and wasn't needed much otherwise as the Panthers needed to pass only 49 percent of the time in a 20-9 road win against the Jaguars. At 25 percent, Matthews was the only Eagle to account for more than 20 percent of Sam Bradford's targets. The Jets did what was expected as home favorites against the worst offensive skill-position players in the league. Bradford showed why he was a popular play with 52 attempts and 336 yards, but only passed for one TD while the Eagles rushed for two. FanDuel 4for4 Football Championship - Enter for Week 2 Now for your Chance to Win $30,000 in Prizes! Click HERE to enter a qualifier FanDuel's 4for4 Football Championship. Compete against 4for4 experts each week until Week 10 for one of 50 seats to the FanDuel Championship, where all 50 winners are guranteed a share of $30,000 in cash prizes. The entry fee is $10, and you can now enter up to 20 times!